All fishos should visit Corroboree Billabong, a waterhole on the NT’s Mary River, at least once. 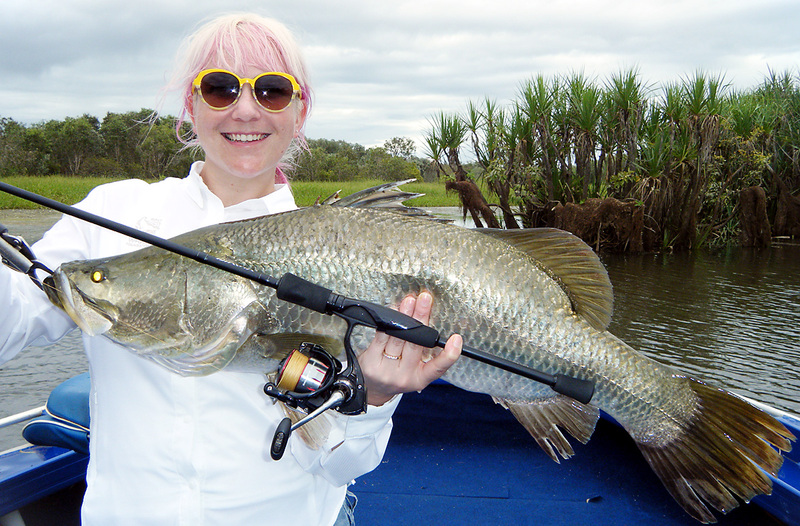 It is a beautiful and a prolific barramundi fishing spot, renowned for its wildlife, including big crocodiles. Every year the fishing quality is quite different, depending on how big the wet season was. This year there wasn’t a big flood, and saratoga and tarpon have been the main catch around the lilies. There are plenty of smaller barramundi about, and the odd big fish to keep life interesting, such as this one, Lesley Mason from Sydney with a nice Corroboree Billabong barra, caught with Obsession Fishing Safaris. Obsession’s Justin said: “We have been getting a lot more barra on the cast this year than the troll. “With the late Wet, the lillies did not get a good flushing so there are a lot of old stems standing which fouls lures on the troll. “So a change of game plan has done the job and casting weedless soft plastics to the weed beds and amongst the lily stems is the way to go, we are also catching a lot of ‘togas this year also. “So away with the baitcasters and in with the spin sticks and the old faithful electric. Other NT waterholes such as 2-Mile and 4-Mile Holes on the Wildman RIver, have produced the same quality of fishing this year. Corroboree Billabong is a good place to fish weedless surface lures and flies. Nearby Hardies Lagoon and the Rockhole are also great spots. All are accessible off shirt dirt road sections from the sealed Arnhem Highway.